My husband surprised me with two nights at Morongo Casino Resort & Spa and it was truly a surprise. I loved it. I was jonsesing for gambling but didn’t feel like flying to Vega$ baby so he found a special Player’s Package on line (came with free gambling money, some meals, room and a few extras), he also booked me an afternoon of spa treatments and voila the perfect solution. It was one of the best birthday celebrations. I became a member of the Winner’s Club where you get cash back and/or perks for your play. I’m happy to report that I actually left a winner. Got a payoff on the $1 slot. The hotel has a friendly, non-Vegas-like ambiance. Our room was huge, spanking clean and had an awesome view of the mountains from a large window. There’s two large pools, great sunning deck area, cabanas, a nicely equipped gym and super spa with steams, saunas, whirlpool and cold plunge. My massage was excellent and also part of the package, and after looking at the prices, I highly recommend getting a package. Massages at the Sage Spa run from $85 to $205! The food was better than expected, especially the breakfast buffet. The penthouse restaurant has awesome views of the desert but since it was so warm out and the room is enclosed we decided to go into Palm Springs where we ate outdoors at Kaiser Grill, which turned out great because a street fair was in progress and we had front seats. It felt like a major celebration with hunderds of people, live music, and revelry. Kaiser Grille, an inexpensive indoor/outdoor has a swinging bar and excellent barkeep and wait staff. I had a glass of top Chard at the bar for only $3.50, can’t beat that these days (the wines by the glass at Morongo were nearly 3x that). Morongo is located at 49500 Seminole Drive, Cabazon, CA 92230–it’s on an Indian reservation. 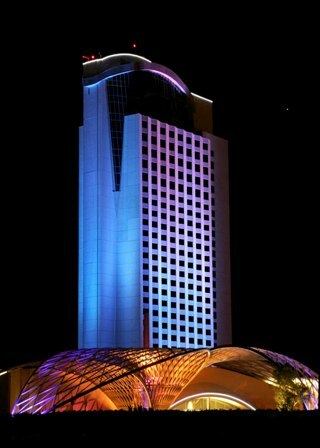 http://www.morongocasinoresort.com/.